How many times have you woken up with night-old makeup? Mascara smudged all over your face? Foundation and powder settled deep in the pores of your skin? Blotches and the tiny white bumps that are sure to develop into ghastly zits before the day ends? C’mon, be honest and confess… if only to make me feel better about my own transgressions! Yup! As a beauty editor, I have written reams on how you need to take off every single speck of makeup and never, ever hit the bed with skin that’s even a smidgen less than squeaky clean. However, the reality is that we all slip up frequently enough. So let’s talk about damage control instead. To make amends, start your morning with a power cleanse: whisk away all the makeup with a cleansing oil (nothing in the world can beat those by Shu Uemura) or an intense, soap-free face wash. Let the cleanser actually sit on your skin for at least 30 seconds for the active ingredients to work their way through the muck. Then exfoliate with an enzyme-based scrub (try this recipe if you want to go the natural route) to whisk away the grimy dead cells and step up circulation, thereby brightening up your complexion instantly. Once this is done, kick the recovery into high gear with a stimulating face mask – anything that contains peppermint (Lush Mask Of Magnaminty) or tea tree oils (The Body Shop Tea Tree Face Mask) will perk up your skin in a shot! Follow with your daily moisturiser but actually massage it into your skin for a couple of minutes to bust the puffiness and plump away the lines. In a pinch, massage your entire face with an under eye cream that’s specially formulated to banish puffiness. And if even that’s not enough, slather on a flash balm – like Clarins Beauty Flash Balm – that adds a layer of light reflecting moisture and stimulates the skin for a fresh flow. 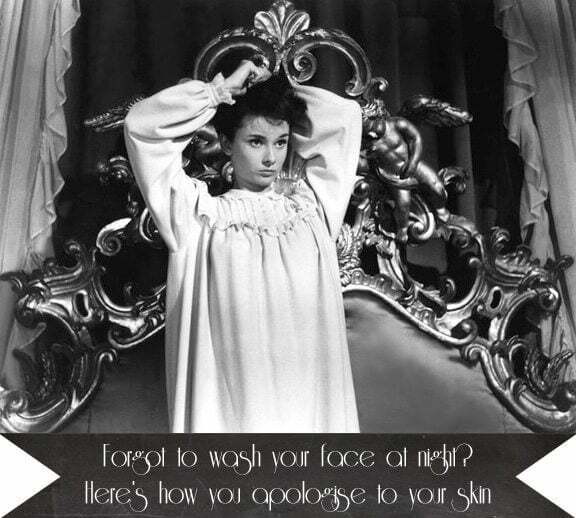 There… your skin forgives you. Just don’t make a habit of it! Do you was your face every single night? Really? I’m a huge fan of the Body Shop Tea Tree face mask- it’s my favorite product from that line. Great post!